Part of Cornell University Library’s Division of Rare and Manuscript Collections, the Witchcraft Collection contains more than 3,000 titles documenting the history of the Inquisition and persecution of witchcraft, primarily in Europe. How to Find Materials. The Witchcraft Collection is open to the public. To schedule a research visit or ask a question, please fill out our reference form. Terms of access and research policies are described on the Division’s Registration & Guidelines for Use and Reproductions & Permissions pages. To identify items in the larger collection, the majority of which are not yet digitized, you may explore Cornell’s Catalog by author, title or keyword search terms. The Witchcraft Collection also contains unpublished manuscripts which are described in a Finding Aid for Manuscripts in the Witchcraft Collection. Collection Highlights. The majority of the Witchcraft Collection was acquired in the 1880s through the collaborative efforts of Andrew Dickson White, Cornell's first President and a prodigious scholar and book collector, and his first librarian, George Lincoln Burr. Due to the foresight of White and Burr, the Witchcraft Collection has become a rich source for students and scholars of the history of superstition and witchcraft persecution in Europe. It documents the earliest and the latest manifestations of the belief in witchcraft as well as its geographical boundaries, and elaborates this history with works on canon law, the Inquisition, torture, demonology, trial testimony, and narratives. The collection focuses on witchcraft not as folklore or anthropology, but as theology and as religious heresy. 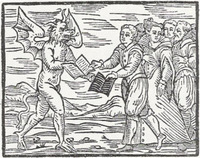 It contains many early texts from the period when the theory of the heresy of witchcraft was being formulated, including fourteen Latin editions of one of the more sinister works on demonology, the Malleus Maleficarum, which codified church dogma on heresy. Four of these Latin editions were printed in the 15th century, most notably the scarce first edition printed before April 14, 1487. The collection also contains other defining texts of the doctrinal discussion of demonology, such as Jean Bodin's De la Demonmanie des sorciers (1580), Nicolas Remi's Daemonlatreiae (1595), Henri Boguet's Discours des sorciers (1602) and Pierre de Lancre's Tableau de I'inconstance des mauvais anges (1612). Significant in the collection are a small and extremely rare number of works by theologians who opposed the Inquisition, such as those of Cornelius Loos, the first theologian in Germany to write against the witch hunts. The most important materials in the Witchcraft Collection, however, are the court records of the trials of witches, including harrowing original manuscript depositions taken from the victims in the torture chamber. These documents, in both original manuscript and print, reveal the harsh outcome of the more remote doctrinal disputes. Perhaps the most significant of all manuscripts in the Collection is the minutes of the witchcraft trial of Dietrich Flade, a 16th-century city judge and rector who spoke out against the cruelty and injustice of the persecutions in the 1580s. The manuscript was discovered in Germany and acquired by Andrew Dickson White in 1883.